Pulse~Link is always looking for new and innovative team members who are passionate about creating products that elevate today’s technology. If you are an individual who is interested in working in a creative and challenging environment, continually learning, and being part of a team that creates together, send us an email with your information. Pulse~LINK is looking for a talented Embedded Systems Engineer (software) to join its team. 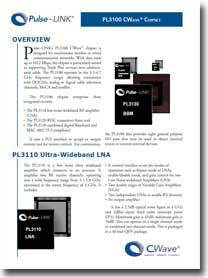 Pulse~LINK is a fabless semiconductor manufacturer in the UWB (Ultra Wide Band) space. We are focusing on innovative solutions for the cable TV industry and bringing more performance to this infrastructure. The candidate will focus on the design and development of embedded software for an 802.15.3 based network specifically in the TDMA scheduler and other associated firmware in our own baseband IC. He/She will work in cooperation with other embedded/software engineers and design partners. Salary: Competitive salary, final amount depends on experience.